NDP leader Jagmeet Singh speaks to reporters with NDP environment critic Alexandre Boulerice on Parliament Hill in Ottawa on April 11, 2018. OTTAWA — Should Jagmeet Singh run for the Montreal seat held by his predecessor Thomas Mulcair? That's a question the current NDP leader says he's still seriously pondering. "I'm considering all my options," Singh told reporters Wednesday about possibly running in Outremont. He's listening to counsel and is "always open to hearing folks' input on any byelection that opens up." The NDP has held Outremont since Mulcair won it in a byelection in 2007. Up until 2011, it was the only NDP seat in Quebec. Winning a byelection there — Mulcair has announced he's stepping down as MP in June — would boost the NDP's fortunes in the province leading up to the general election in 2019, said the party's Quebec lieutenant Alexandre Boulerice. "We're juggling with the idea right now. It would be audacious. It would be bold, but still, Outremont, we've won it four times. Last time, we won it with 5,000 votes," he said. 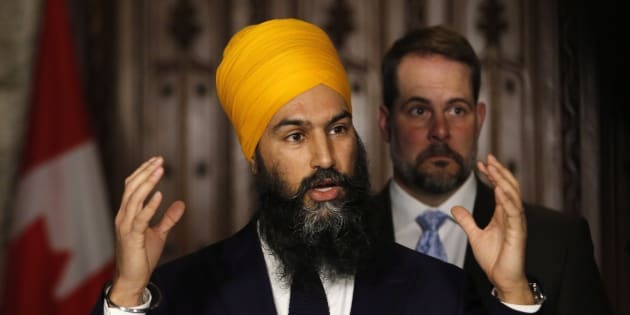 "There are pros and there are cons...The gains would be if we win the gamble, that sends a pretty strong message about the strength of the NDP and the importance of Quebec for Jagmeet Singh," Boulerice added. "At the same time, it could be seen as bravado and it could be more risky, maybe Mr. Singh would have greater affinity with an Ontario byelection." Running in Outremont also carries a lot of risks. "Mr. Singh [was] a provincial member from Brampton, in Ontario, and has few links to Montreal and few roots with the local community, so it could be difficult," Boulerice acknowledged. "[He] has a lot to learn about Quebec and Montreal society. He is extremely curious, and he learns very quickly, but it's not his home." Boulerice played down suggestions from a Quebec reporter that Singh's turban — the NDP leader is a devout Sikh — would turn off some of the riding's voters. "We need to move on from that debate about the wearing of religious symbols," he said, in French. "At some point, there is a difference between appearance and competence and, at the end of the day, the people will judge on competence." There is some pressure on Singh, who was chosen as NDP leader last October, to take a seat quickly in the House of Commons. Mulcair recently told CTV that he thinks "it's important for a political leader to get in [Parliament] as soon as possible so that Canadians can get to know him." A recent public spat between Singh and leadership challenger Ontario MP Charlie Angus and Quebec MP Romeo Saganash over a punishment levied on colleague David Christopherson for voting against the party line also spurred calls for the leader to spend more time with his parliamentary caucus. It's important for the leader to travel across the country and meet with communities, Boulerice said, but also that he spend time on Parliament Hill with MPs, staff and even reporters. "There is a balance that needs to be found there. Being elected as an MP would force him, obviously, to spend a lot more time in Ottawa." Former NDP national director Karl Bélanger cautioned a decision about where Singh should run shouldn't be made lightly. "You cannot run in a byelection you are going to lose," Bélanger, the president of The Douglas-Coldwell Foundation, told HuffPost Canada. "If they are doing their research and they are looking at all aspects of it, and they think that he will win, they should consider it — however, they shouldn't assume that all the Mulcair votes will transfer to the new leader." Outremont is a seat that belonged to the Liberals for decades before Mulcair, a former provincial Liberal cabinet minister, won it for the federal NDP, Bélanger noted. "They can't assume it is an NDP seat... One of the reason it went to the NDP was because of Thomas Mulcair's candidacy." Some Liberals are already organizing in Outremont where a nomination battle has yet to be called. Concordia University political science professor Kimberley Manning is interested in the seat, as is the Grits' 2015 candidate and former staffer Rachel Bendayan. Bendayan has been pounding the pavement for months and recently boasted of having more than 100 volunteers. The Jewish woman lives with her family in the largely well-to-do riding with a large Jewish community. Asked about Singh's prospects, the Liberal riding president, David Marshall, suggested the NDP leader has no chance. "I think we're going to win it! ", he told HuffPost. Running in Outremont "would be a very dangerous move," Bélanger said. "The worst thing that could happen 18 months out of an election is for the leader to run in a byelection and lose," he explained. "If the new leader doesn't win the seat of the old leader, [the argument will be] where else could he win seats?"